Here at the GSGATL History and Archives committee, we are so excited! Everything is almost ready- crafts, games, songs, s’mores, presentations, and more! We will have lots of fun vintage items on display at our booth in the Camp Timber Ridge Dining Hall, and some of us will even be wearing some vintage uniforms! Brownies, Juniors, and Cadettes even have a chance to earn the Girl Scout Way Legacy Badge while at the celebration (badge itself is not included) so make sure to stop by the coloring station to pick up your worksheets! 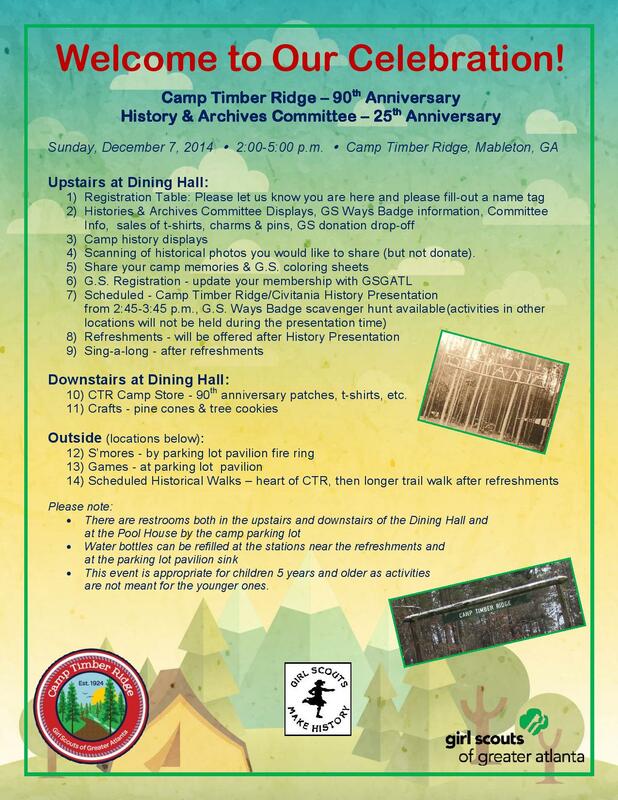 Posted on December 4, 2014, in Camp Timber Ridge (GSGATL), History / Archives Committee and tagged archives, birthday, Camp Timber Ridge, camping, committee. Bookmark the permalink. 1 Comment.